Business requirements fundamentally drive the evolution of IT services in an organization. 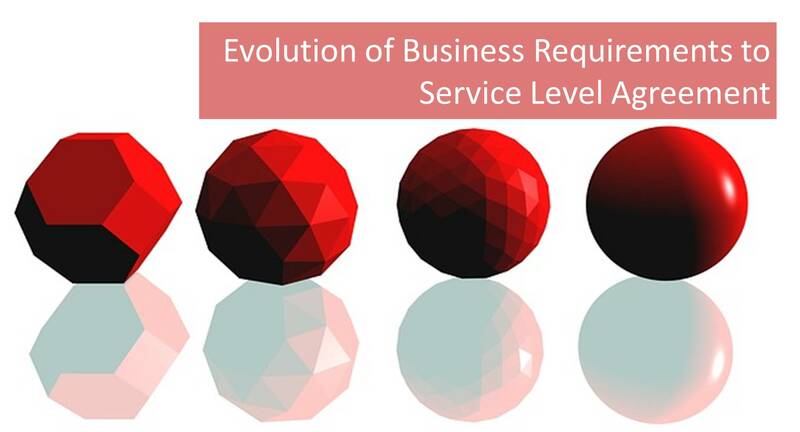 It is import to understand how business requirements evolve into a service level agreement. According to online ITIL training, business requirements are generated based on the vision and objectives of the organization. And these business requirements drive and determine the IT strategy of the organization. ITIL training teaches us that the ITIL lifecycle consists of five stages: Service Strategy, Service Design, ITIL Service Transition, ITIL Service Operation and Continual Service Improvement. Throughout these stages, the organization’s business requirements evolve from ideas to concrete service level agreements. A service level agreement is a document that stipulates the exact responsibilities of the IT service provider and its customer in terms of delivering a service. Performance metrics are specified as a minimum requirement of the quality of service that should be given. These performance metrics are based on business requirements and sometimes there must be a compromise between the business requirements and the capacity of the IT service provider to ensure that the performance metrics can realistically be met. Drawing up a service level agreement starts with the ITIL service strategy of the organization. Based on the service strategy of the organization, new services or changes to the existing services are designed during the Service Design stage of the ITIL service lifecycle. Performance metrics that will eventually form part of the service level agreement are already identified in the ITIL Service Design stage. After the design of the new or changed services, these services are implemented, tested and deployed during the Service Transition stage of the service lifecycle. And from Service Strategy stage to Service Transition stage, all business requirements are documented and agreed between the business and IT service provider. These business requirements form the base on which the eventual service level agreement will be built. There can be changing requirements or new requirements of the business based on the development of the services through the service lifecycle. Therefore during the Service Strategy, Service Design and Service Transition stages, business requirements are documented and managed as the service level requirements of the business. 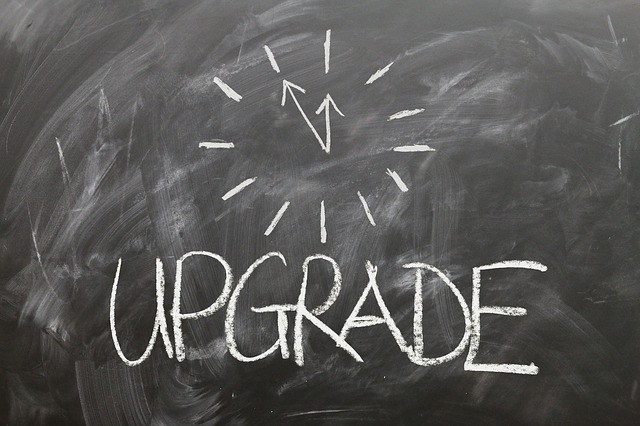 Changes to the business requirements during these stages are monitored as these will affect the service level agreement between the IT service provider and the business. The service level agreement must be regularly revised to reflect any changes in business requirements. This will ensure that the service provider is accountable only for the services that are relevant at the specific moment in time and not on outdated business requirements. Outdated service level agreements can result in business requirements not being met which can ultimately result in loss of sales and value to the business. After successful tests, implementation, and deployment of the new services or updates to the existing services, the Service Operation stage starts. During Service Operation, the end user of the service starts to use the service in a live environment. Therefore, negotiated service levels between the IT service provider and the business must be met for ensuring the required service delivery quality. A service level agreement is needed to document the negotiated service levels that must be met. In order to check whether the required service levels can be met in a live environment, a service level agreement pilot is issued. The pilot service level agreement should be run with a user group that is not so large to cause widespread damage if things go wrong, yet large enough to draw conclusions and to make modifications for general implementation. Although tests are already conducted in the Service Transition stage to see if the ITIL service level targets can be met, a live environment can differ from the test environment and the planned targets or service levels might need revisions which would call for a new service level agreement. For instance, although you expected and planned to use one server for the service, during the first phases of live operation, you might realize that additional servers are needed to meet the required service level targets. Therefore, before signing off an official service level agreement, a service level agreement pilot is run and checked whether the planned service level targets can be met by the IT service provider. During the pilot phase, if there is not any problem to meet the planned service level targets, the service level agreement for the live environment is signed off between the IT service provider and the business. 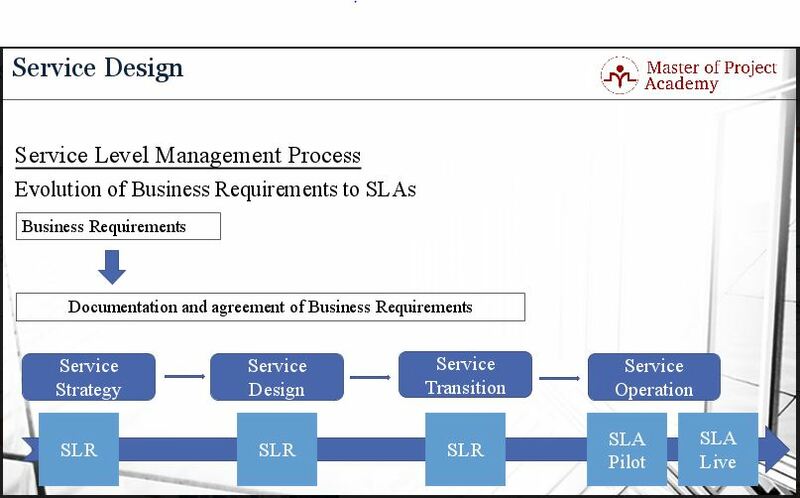 The service level agreement also features in the Continual Service Improvement stage of the ITIL service lifecycle. As the service is modified and improved, the service level agreement needs to be modified and improved as well. New service level targets may be applicable and these need to be incorporated into the service level agreement. Service level agreements must be reviewed periodically as part of the Continual Service Improvement process. It may be that one of the metrics that are specified in the original service level agreement is not relevant anymore or that a new metric needs to be added that wasn’t thought of when the original service level agreement was signed. In these cases, the service level agreement can be revised if both parties agree that it should be done so. To summarize, from Service Strategy to Service Transition stage, business requirements are determined, gathered, documented and agreed as service level requirements. After the successful deployment of new service or changes to existing services on a live environment, service level requirements are turned into a service level agreement between the business and IT service provider. Service level agreements create transparency between the IT service provider and its customer, be it the business, specific business functions or the end-user. It stipulates exactly what the customer can expect from the IT service provider. You may want to test your knowledge about Service Level Agreements, we advise you to take a sample ITIL foundation exam to see how you score and be ready for the real ITIL exam.